Lucie Greene--Worldwide director of the Innovation Group, J. Walter Thompson's in-house futures and innovation think tank--discusses her bold and timely work, Silicon States: The Power and Politics of Big Tech and What It Means for Our Future. A bracing look at how Google, Apple, Amazon, Facebook, and other Silicon Valley power players are using their influence across the globe to encroach upon our civil landscape. In an era when faith in government and its institutions is quickly eroding, the businesses of Silicon Valley are stepping in to fill the gap. With outsize supplies of cash, talent, and ambition, a small group of corporations have been gradually seizing leadership--and consumer confidence--around the world. 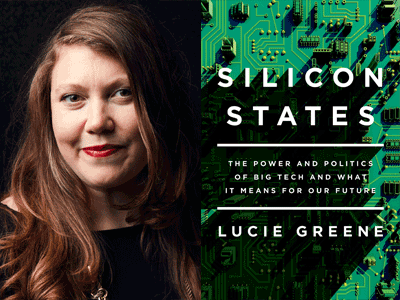 In Silicon States, renowned futurist and celebrated international think-tank leader Lucie Greene offers an unparalleled look at the players, promises, and potential problems of Big Tech. Through interviews with corporate leaders, influential venture capitalists, scholars, journalists, activists, and more, Greene explores the tension inherent in Silicon Valley's global influence. If these companies can invent a social network, how might they soon transform our political and health-care systems? If they can revolutionize the cell phone, what might they do for space travel, education, or the housing market? As Silicon Valley faces increased scrutiny over its mistreatment of women, cultural shortcomings, and its role in widespread Russian election interference, we are learning where its interests truly lie, and about the great power these companies wield over an unsuspecting citizenry. While the promise of technology is seductive, it is important to understand these corporations' possible impacts on our political and socioeconomic institutions. Greene emphasizes that before we hand our future over to a rarefied group of companies, we should examine the world they might build and confront its benefits, prejudices, and inherent flaws. Silicon States pushes us to ask if, ultimately, this is the future we really want.